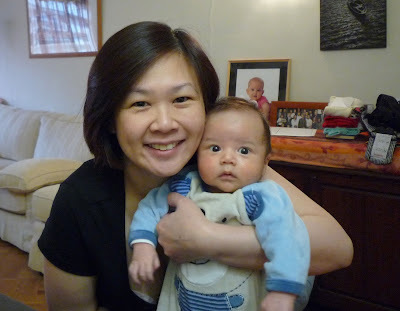 My little boy is becoming rounder by the day. I thought normally breastfeed babies are leaner but this little babe of mine is gaining weight very quickly. I weigh him at home and he is almost 5kgs! Scary! I am developing muscles on the arms from carrying him. Here's a picture of us together. Doesn't he look very Asian in this photo? I am still rather tired most of the time but luckily aside from that horrible night, the rest of the other nights have been more normal. And by normal, I mean that I only have to wake up around 3 times a night (usually around midnight, 3am and 6am) and each time I'll be up for anything from 30mins to an hour to feed, change and put back to sleep. Last couple of nights, I also had to clear his blocked nose as the poor boy has a little cold. Since the last post a lot of concerned friends has been asking how I'm doing. Generally I am fine but I think my frustration has to do with not seeing a light at the end of the tunnel. I do not mean just how much work having a newborn is, this I know will get better just as it did with Laetitia. What I mean is I do not see the light at the end of the tunnel for getting out of this SAHM (stay at home mum) situation. I know some people are saying oh how luckily I am to have a supportive husband and be able to stay home etc but that is if I want to stay home. The thing is, I DO NOT want to stay home anymore. Come on, it's going to be FOUR years of doing that. Enough is enough. Good for you if you want to stay home but I want to work. And not just do a normal boring job, I want to go back to an exciting working life. I want to feel challenged. I want to work my brains and fill them with marketing ideas. I am upset that the darn financial crisis has 'delayed' our plans to leave Paris. And even though the delay is suppose to be for 6 months or slightly more, I dare not put too much thoughts to it in case there are more changes. I try to tell myself that I am very blessed with two lovely children and yes, they are very precious to me. Laetitia is a wonderful big sister and Loïc is a very adorable baby. I just need a little more balance in my life in terms of something outside of being a mother so that I can be a happier and better mummy to both my darlings. Is there some ad-hoc or even FREE work that you could do - just so that you can be working again? That is what I did in the one year that I stayed home to be a SAHM to Sophie. I volunteered in an assoication, I studied, I got an Italian driving licence, I basically just did everything that came my way, just so as to keep my skills updated. I totally understand, and I can feel your frustration and I guess you have to wait it out a bit more. But there IS LIGHT ! don't lose hope. Newborns are so much work. Grandparents are here for a visit.